Now that the conference Facing the Multicore-Challenge III is over and the results have been published, I can finally upload them here. 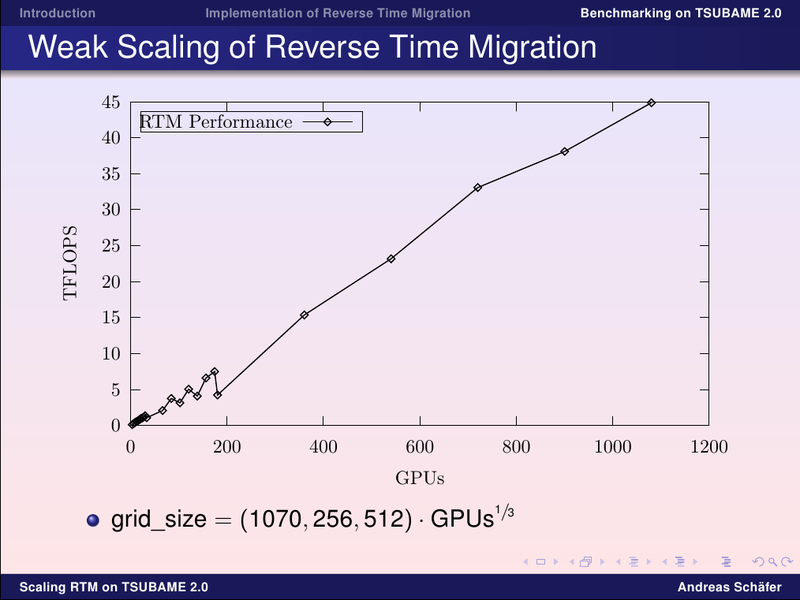 The image summarizes... the results of our scaling tests of a reverse time migration kernel (RTM) on Tsubame 2.0. We've reached an weak scaling efficiency of more than 90% on 1080 GPUs, or, to put it more dramatically, more than 480k cores. The zig-zag shape of the graph is caused by the domain decomposition technique we've employed: recursive bisection is fast and yields cuboid decompositions, but for certain numbers of nodes the aspect ratio of the subdomains may not be perfect.